We just bought a large bag of quinoa and I needed some inspiration to use it up. I recently saw a very enticing chimichurri skirt steak recipe by Sage Recipes that has had my mouth watering for weeks. Emily's chimichurri skirt steak was inspiration enough to run to the store and scoop up some fresh large shrimp! Hubby and I haven't had much seafood lately (an unfortunate aversion due to pregnancy, which was over 3 years ago!) and it was time to get my feet wet again. Chimichurri is a traditional Argentine sauce. Some folks confuse the two analogous sauces, pesto and chimichurri. Although they are very similar, pesto is a basil based sauce with nuts, oil, garlic and more recently cheese. Chimichurri is a parsley based sauce with garlic, red pepper flakes, vinegar and salt. Both are fantastic and are my favorite sauces to whip up and add to grilled meats or fresh pasta. I'm known to sometimes overly garnish my foods with this fantastic sauce. I would drink it if I could. Oh wait, I have! Really, it's that good! My recipe has an added jalapeno kick, although it's easily adaptable. Have fun with it and don't be shy to over garnish! Your taste buds will thank you! HAPPY MOTHER'S DAY! You deserve this special day! Place prepared shrimp in a bowl or ziplock bag, set aside. Pour all ingredients, except shrimp and creme fraiche, in a food processor. Blend until well combined. Spoon 3/4 of chimichurri into shrimp bowl, cover and refrigerate for at least 3 hours. I recommend marinating overnight. Spoon remaining 1/4 of mixture into a small bowl, cover and refrigerate until ready to use. Preheat the grill on medium heat. Skewer the shrimp or place directly on grill. Grill until outside is pink, about 4-6 minutes., depending on shrimp size. Plate quinoa, top with shrimp and drizzle with creme fraiche. 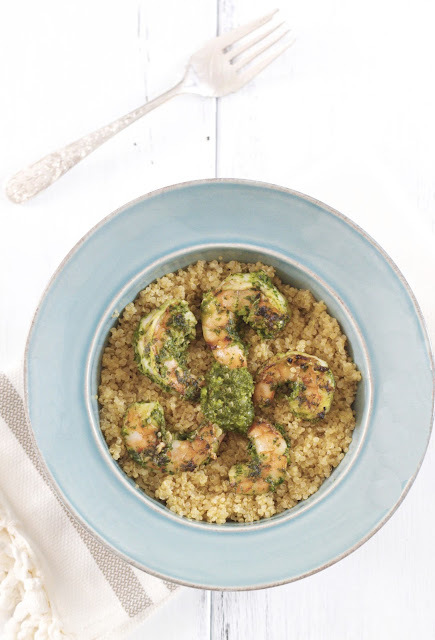 I love chimichurri and on this shrimp it looks positively mouthwatering, Katie! Wonderful recipe and beautiful photos. Have a happy Mother's Day weekend! I forgot to tell you....I hope you have he most wonderful Mother's Day!!!!! This looks lovely, Katie! I love chimichurri and grilled shrimp but never had the combination together. What a fabulous idea to have it on a bed of quinoa. I look forward to adding this to my menu. Beautiful! Wishing you a very Happy Mother's Day!!! Voted! And this sounds so good, Katie! I love quinoa, and shrimp, and chimichurri sauce, so to mix it all together is just amazing. The added spice is perfect too and I'm drooling over your amazing photos, as always! This looks delicious, and perfect with quinoa! 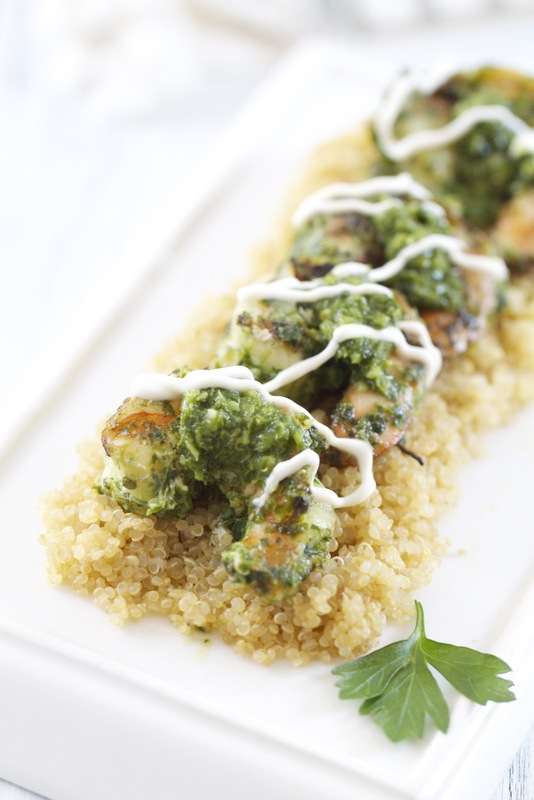 How smart to top your shrimp with chimichurri! This looks delicious. Headed over to vote for you now :). I hear ya on aversions lasting waaay beyond pregnancy. That's me with lobster. Ick. Those look incredibly flavorful! I've actually never made a chimichurri sauce before, but from the ingredients it looks amazing! This looks absolutely mouth-wateringly AH-MAZING. I'm a big fan of chimichurri sauce, and I just love that creme fraiche drizzle! Oh this looks soooo fantastic! I want to rub that sauce all over myself. Hi Katie! I'm so glad that I could inspire this amazing dish! It looks so good! I hope you had a wonderful mother's day!! You inspired me too...I'm making shrimp tonight!! Looks amazing! I have chimichurri on dock too! 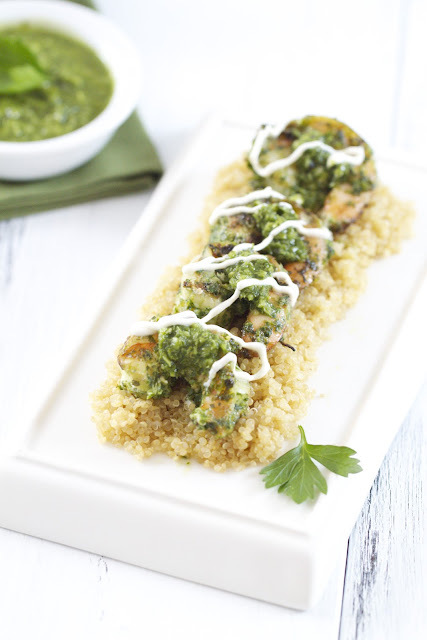 I've never actually tried chimichurri before so this would be a fun dish to try! I love the creme fraiche drizzle--makes it pop! Happy Mother's Day (Belated)! These shrimps are fantastic, and what a way to make quinoa more appetizing! Love the styling as well! This sounds spectacular! I can't wait to give this recipe a try! I voted for you! This recipe looks delish- I'm always looking for quinoa recipes. I voted! This recipe looks delish- I'm always looking for quinoa recipes. I absolutely LOVE chimichurri! I can imagine that combined with shrimp it must be amazing. It sure does looks delicicous! This is a must try.